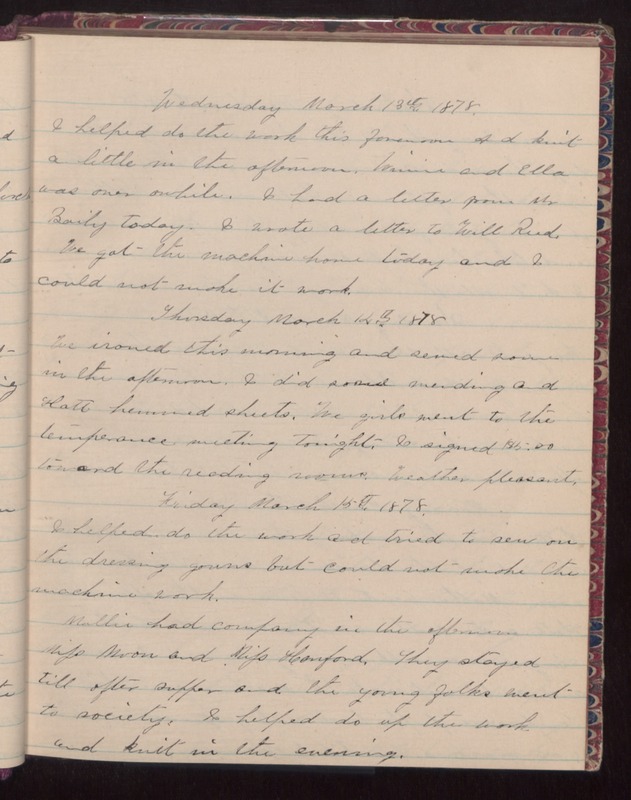 Wednesday March 13th 1878 I helped to do the work this forenoon and knit a little in the afternoon. Winnie and Ella was over awhile. I had a letter from Mr. Bailey today. I wrote a letter to Will Reed. We got the machine home today and I could not make it work. Thursday March 14th 1878 We ironed this morning and sewed some in the afternoon. I did some mending and Hatt hemmed the sheets. We girls went to the temperance meeting tonight. I signed $5.00 toward the reading room. Weather pleasant. Friday March 15 1878 I helped do the work and tried to sew on the dressing gowns but could not make the machine work. Mollie had company in the afternoon Mike Moon and Miss Hanford. They stayed till after supper and the young folks went to society. I helped do up the work and knit in the evening.